Angelina Jolie ’s latest project is a subject very close to her heart, so it made sense that all six of her children joined her for the world premiere. 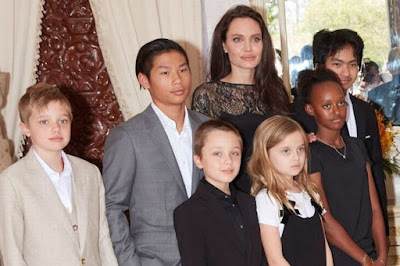 The Hollywood star was joined by Maddox, 15, Pax, 13, Zahara, 12, Shiloh, ten and eight-year-old twins Vivienne and Knox for a screening of First They Killed My Father in Cambodia. It marks the actress’ first red carpet appearance since her split from Brad Pitt last year, and the first time she’s made a public appearance with all of her children without him. While Zahara wore a loose dress and Vivienne opted for a jumpsuit, Maddox, Pax and Knox all wore smart suits, as did tomboy Shiloh. Angelina has kept away from the spotlight since her marriage to Brad broke down last year. The Hollywood couple announced in September they were splitting after a twelve-year relationship and two years of marriage. It came as a shock to many who had considered them rock solid. In their first joint statement since the split, the couple said: "The parties and their counsel have signed agreements to preserve the privacy rights of their children and family by keeping all court documents confidential and engaging a private judge to make any necessary legal decisions and to facilitate the expeditious resolution of any remaining issues.